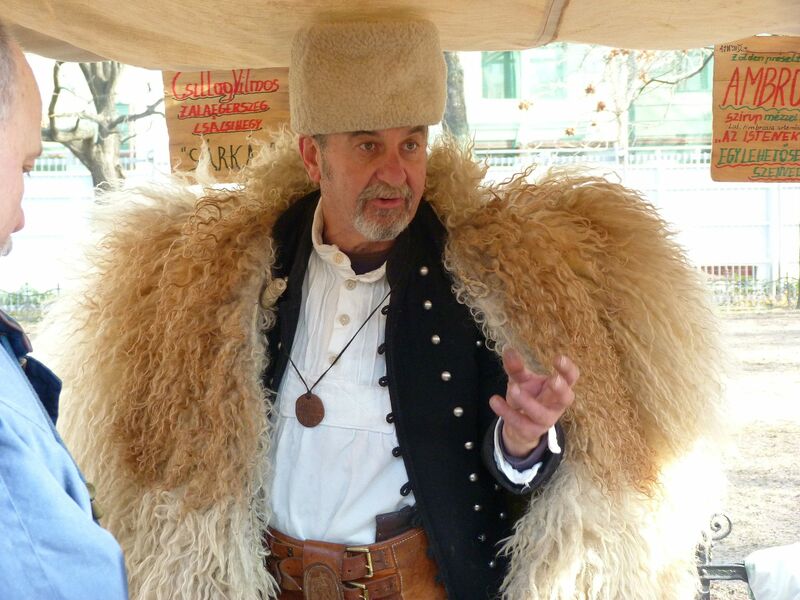 A traditional Hungarian Herdsman in full regalia. Photo from Fabko.com. Going camping recently, despite the intense cold that would probably stop most people from doing it again, Michael and I started talking. He asked about the origins of Goulash. He knew, as did I, that originally Goulash was made by the sheepherders of Hungary and apparently dates back to the 9th Century or so. He and I have talked about it for some time, foodie and chef that he is. He mentioned that maybe we should think about finding a bogrács to make goulash on the campfire. The bogrács system is something I had never seen as a kid, and I don’t remember my grandparents talking about it. Recently, thanks to the Internet, we are more aware of the origins of Goulash. Apparently the word itself meant cowboy. Sheepherders would pull out their tripod system and make their stew this way. I did a bit of online research on Saturday and came up with information on purchase of the kettle and tripod that you set up over a fire (perfect for the American campground fire pit). Then I found out that it was in Elizabeth, New Jersey, a Hungarian-American enclave. While perusing the sight as I guess I am still not at the point of bogrács purchase, I came across ‘kenyérszalonna’ which is something I do remember from childhood. Whenever we would cook outdoors, this seemingly disgusting practice (only to non-Hungarians) would take place. A special piece of very fatty smoked bacon is cut into a small rectangle of about 2″ x 3″ and scored before being put on a long barbecue fork. It is slowly warmed and roasted over a fire and when the grease flows, it is put on fresh rye bread . When a certain amount of bacon grease is on the bread, vegetables are often added: finely sliced onions, green peppers, and thinly slice radishes. More bacon grease is dripped on it. Then it is eaten. Mary Kay was totally grossed out by the prospect until she tasted it and became a fan. The szalonna rectangle is then ‘cooked’ until it shrivels up and much of the grease is gone. My grandparents would always slice off bits and serve it to me on rye bread squares. Delicious! 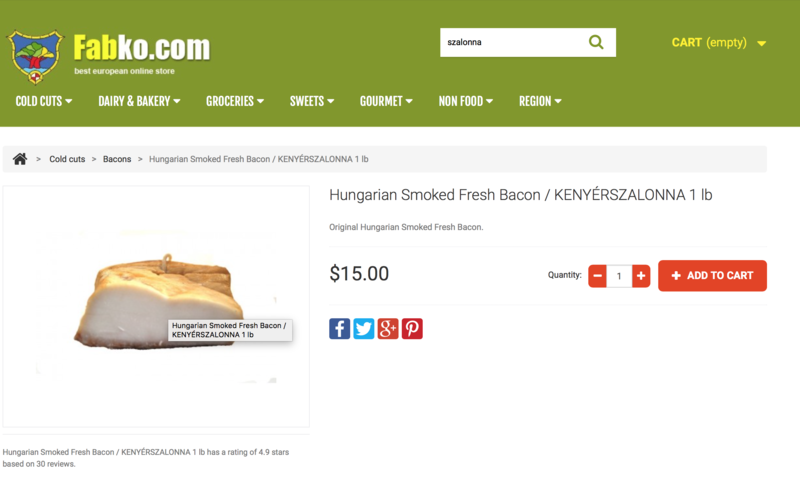 For years, I have been unable to find the real kenyérszalonna (kenyér means bread, szalonna bacon) so I cannot wait for my purchase to arrive from New Jersey. We will have it for an apéritif before a family dinner. Should I buy that bogrács? This entry was posted in Goulash, Hungarian, Hungarian cuisine, Hungary, Life in general, Thoughts and philosophy. Bookmark the permalink.